Detail from Cabaret Voltaire by Howard Munson (2015). 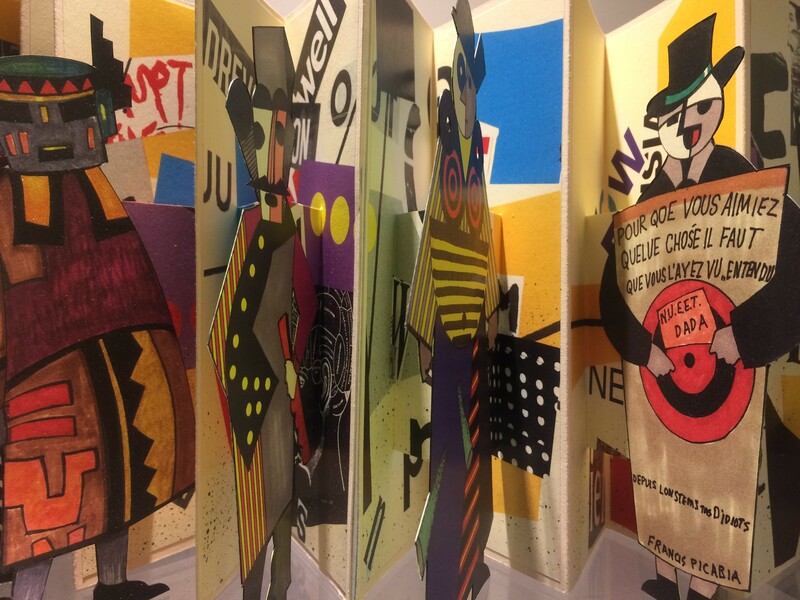 Featuring work by Edgar Arceneaux, Johanna Drucker, Brad Freeman, Karen Hanmer, Mac McGill, Joni Mabe, Bruno Munari, Howard Munson, Bonnie O’Connell, Ed Ruscha, Daniel R. Smith, Keith A. Smith, Michael Snow, and Kara Walker, "Seven Decades of Artists' Books in the UCLA Arts Library" provides a small window into the rich and diverse collection of artists' books held by the Arts Library. Benefitting from major donations from Judith Hoffberg and Robert Heinecken, the collection has grown in size to more than three thousand volumes. Actively used in teaching and outreach, it complements other holdings of artists' books in UCLA Library Special Collections in arts, humanities, social sciences, medicine, and science and the William Andrews Clark Memorial Library. The exhibit was organized by Robert Gore (Visual Arts Librarian) with assistance from Dawn Setzer (Director of Library Communications).